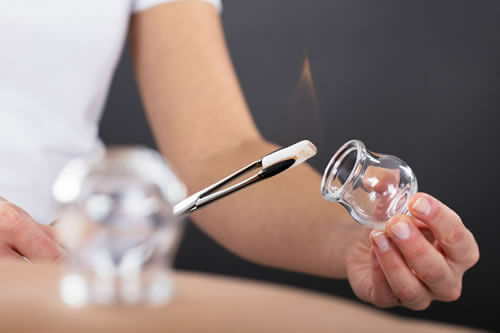 Cupping is a technique that uses suction to relieve qi and blood stagnation. A vacuum is created between a glass cup and the skin either through a pump or through heat. This process brings blood and qi to the superficial layers of the skin and fascia, thereby promoting circulation and free flow. Once the cups are removed patients will often find reddish circles where the cups were placed, which typically fades in a few days. Cupping is helpful in treating musculoskeletal pain, respiratory and digestive complaints. Moxibustion (moxa) involves the use an herb called Mugwort, Artemesia Vulgaris to warm and provide extra stimulation to acupuncture points. It helps promote the flow of qi and blood and is particularly useful for cold and damp conditions in the body. Gua sha is a technique that is used to promote circulation by freeing up blood stagnation or congestion. It involves repeated strokes on the surface of the skin with a rounded instrument which most often results in petechiae on the skin, or small red dots. Depending on the amount of congestion these dots can take anywhere from 2-4 days to disappear. Gua sha usually feels good to the patient, like a deep massage and is helpful for relieving a number of conditions including but not limited to respiratory and digestive complaints, fever, colds and pain. For more information, please visit guasha.com.